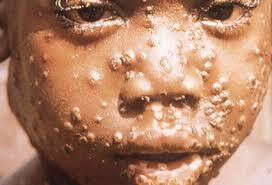 Monkeypox is a zoonotic viral disease that can infect nonhuman primates, rodents and some other mammals. Monkeypox results from infection by the monkeypox virus, a member of the genus Orthopoxvirus in the family Poxviridae. Two clades of monkeypox viruses, the West African and Congo Basin viruses have been identified. The Congo Basin viruses are more virulent. Human monkeypox is a zoonotic smallpox-like disease caused by an orthopoxvirus of interhuman transmissibility too low to sustain spread in susceptible populations. 88 cases of febrile pustular rash were identified for the previous 12 months in 12 villages of the Katako-Kombe Health Zone, Democratic Republic of Congo. Seven were active cases confirmed by virus isolation. Orthopoxvirus-neutralizing antibodies were detected in 54% of 72 patients who provided serum and 25% of 59 wild-caught animals, mainly squirrels. 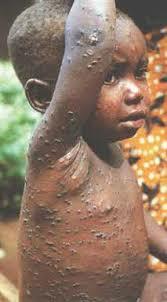 Human monkeypox from 1981 to 1986 in the DRC identified 338 cases. The case-fatality rate was 9.8% for persons not vaccinated with vaccinia vaccine, which was about 85% efficacious in preventing human monkeypox. The secondary attack rate in unvaccinated household members was 9.3%, and 28% of case-patients reported an exposure to another case-patient during the incubation period.